Just thought i'd introduce myself and the car I got a couple of months back now. My name is Darren and I've had a fair amount of cars (including a show beetle) but this is my first foray in to Porsche territory. I plumped for an early S as I like that they're unsullied by a lot of electronics, I want a car to actually drive so I ended up with a 2000 3.2 S with black on black on carrera 5 spoke alloys, manual, no psm. It came fully stamped up and on initial inspection it seemed like a good honest car, it wasn't. The first signs were after a week or so the temp light started flashing. I did the usual bleed and refill and that seemed to cure it but that was the start. I have an old friend called Kurt who runs Black Country Porsche and I booked the car in to him for the suspension looking at and to give it a proper look over but the week before it was to go there the water pump completely failed so it ended up on a lowloader all the way from London to the black country. When Kurt gave it the once over the diagnosis wasn't good, it had a host of parts that needed changing including the oil filler pipe, throttle body cleaning, parts of the intake were leaking, the front coffin arms, both ends arb bushes, the list went on. But after a few quid and some elbow grease it was back and sporting OE 18" twists from a 996 after the 5 spokes were found to be reps and 2 were buckled badly. After the drive back it was apparent that it was now a different car, far more capable than before and a lot quicker but the exhaust had now developed a rattle. 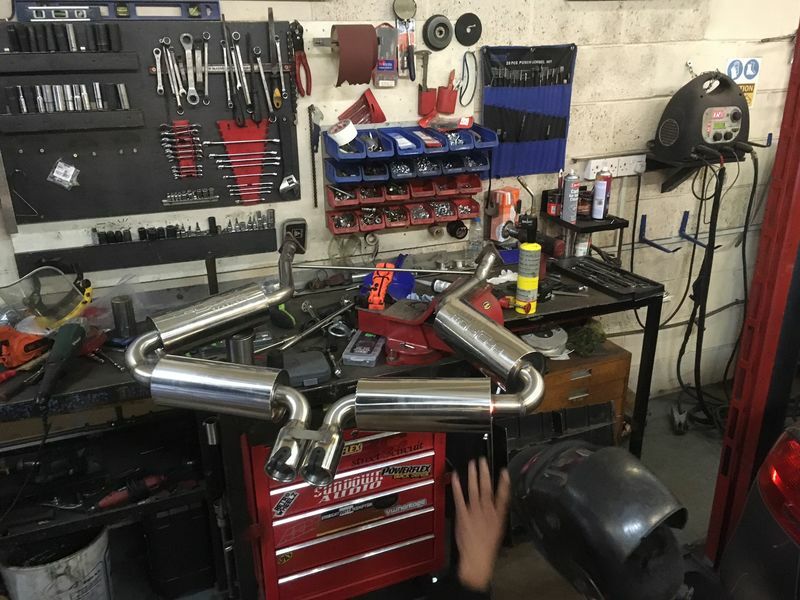 A bit of tapping later and yep, one of the cats has started to die, so off to Style Dynamics for a new custom stainless manifold back system that sounds like Thor himself gargling, it's brilliant. The car is currently at S6 wraps being wrapped in a satin black and having the wheels refurbed in black with new Avon ZZ5 tyres after not one but 2 decided they preferred nails in them. I pick it up later and then to test drive. All this done since the middle of July with fate having a helping hand all the way. Hopefully (fingers crossed) that's it for the time being, i'd love to put an up to date double din head unit in but that will have to wait for now. The forum looks like a great place for info so i look forward to being around here for a while. Welcome to the forum. Sounds like you got off to a rough start with it, but made it through nicely. All of those problems that you mentioned are fairly common for a Boxster that just needed to catch up on neglected maintenance. That wrap and the Black wheels look beautiful. Nice choice. There were a LOT of problems, lol, far more than I originally thought there would be. But it's done now and it's far more of a car than it ever was. That satin wrap looks great! 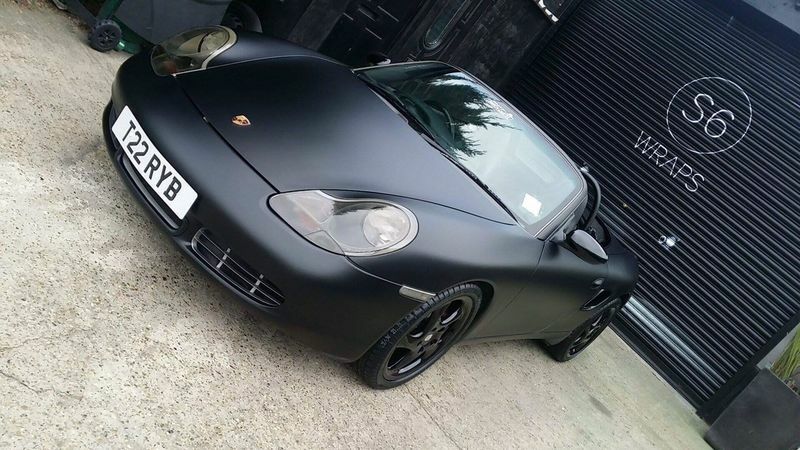 Welcome to the forum, you will find lots of great information here The satin wrap looks great, enjoy your now well sorted Boxster! Thanks for the welcomes guys, appreciated. Exhaust pic for all you noise junkies. Don't you mean the right side? That exhaust looks killer! Who makes that? Welcome! I Like the wrap. I Love the exhaust! A company over here custom made it. 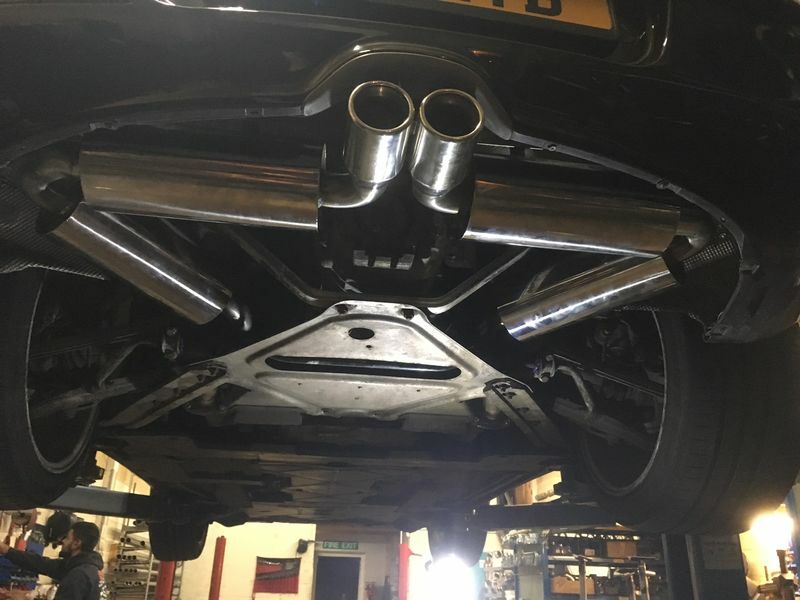 Thanks guys, the exhaust is awesome if a bit loud. I might be looking to tone it down a bit in the future but i'll try and get a video of it before i do. This is it on the bench being made, it's all in one piece so the only gasket is where it meets the manifold. It's also very light compared to the stock muffler and pipes. The bar across the top isn't there any more, that was just on to keep it's shape. I'll see what i can do this weekend, gives me an excuse to go and play.